Jay is an exemplary Chair Car Attendant for LifeLine Ambulance Service. His passion and commitment to his patients is unparalleled; Jay truly treats each and every patient as if they were a member of his own family. He sets a great example for all other employees and raises the bar for the standard of patient care. LifeLine’s mission is to provide respectful, dignified, and compassionate care to all persons entrusted to our care. Jay truly embodies this mission. On April 15, 2016, Jay will retire from LifeLine and travel the country with his family. 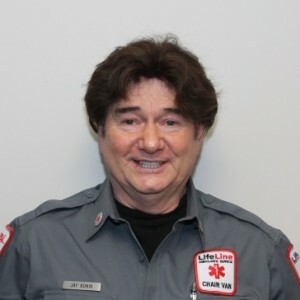 He will forever be missed by his fellow employees and patients.